Christmas 2017 is approaching fast and parents are scouring the net for the next big thing and we still think that children's play kitchens are still a firm winner for both girls and boys. 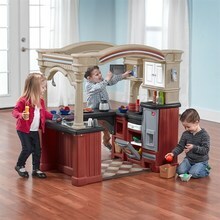 Children's play kitchens allow your children to use their imagination to stimulate elaborate pretend creative play. Two-year-olds love to imitate their parents and the huge range of children's play kitchens from Step2 allows them to do just that.